and knowing that if you make too much noise or if you’re caught, you will be slaughtered. In Gary Paulsen Woods Runner, there is a 13 year old boy, Samuel who lived a peaceful life in the frontier of America in 1776. Samuel comes back to his village one day from a short hunting trip and finds houses on fire, and everyone dead. He cannot find the bodies of his parents, so he starts tracking the barbarians that took them. He eventually finds out he has to break into a British compound in New York to save his parents. Along his journey of the search for his parents, Samuel faces numerous challenges such as fighting off Native Americans, hiding from British soldiers, and struggling against starvation. His strength and perseverance throughout his adventure is the overlying theme of the story. When he set out on his mission, Samuel didn’t have a plan on how to find parents and the criminals who destroyed his town, but he compared tracking the barbarians to tracking animals when he hunts. “…He could not forget himself and his skills now. The people who were leaving tracks were the people he had to deal with. He had to understand them by the time he caught up with them.” Here, Samuel is thinking of how to deal with the people who have his family. Along the way he meets runaways, soldiers, prisoners and rebels who are trying to fight off the British. One of the times Samuel encounters the British. 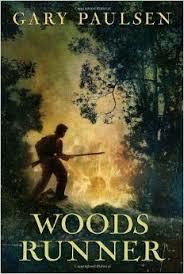 This is when he is lost in the woods and walks right into one the British sergeants. This creates a huge and exciting turn of events at the end of the story. Woods Runner is a combination of historical fiction and adventure it also includes a lot of great setting descriptions. Because of this, it is a book that grabs my interest on many levels throughout the story. Historical theme and high adventure makes the story have more meaning and seem more realistic because its in the past. The detail made me feel like I was right next to samuel throughout his adventure. Those who liked The Hunger Games, My Side of the Mountain and Brian’s Winter will most likely enjoy this book.